UK: Seabed landlord the Crown Estate has reached agreements with developers Dong Energy, Vattenfall and ScottishPower Renewables, redefining the Round Three development zones, and the number of projects they contain. The Crown Estate has renegotiated the deals with the developers to cover project-specfic areas, instead of whole zones, which were awarded in 2009 following a competitive tender. Deals with Dong Energy for the Hornsea Zone, and ScottishPower Renewables and Vattenfall for the East Anglia Zone, have been agreed. Both zones are located off the UK's east coast. Under the new agreements, the parts of the zones that are not included in the specific projects will be handed back to the Crown Estate. This is the second round of renegotiations by the Crown Estate, after the first set of agreements was announced in August 2015. The deals at the Hornsea and East Anglia Zones will give greater clarity to the UK offshore wind sector pipeline. 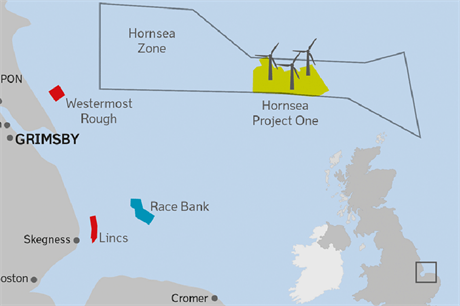 At Hornsea, where Dong Energy gave a positive final investment decision to the 1.2GW Hornsea Project One in February, the Danish developer has also identified three further projects. Hornsea Project Two will be larger than the first development, with Dong planning 1.8GW of capacity. Project Two is currently under review by the UK's planning authority and a planning decision is expected by June 2016. The previously planned Hornsea Project Three has been divided in to two, according to Dong. Project Three will be located to the east of Project Two and has the potential for 1-2GW of capacity. Hornsea Project Four will be developed to the west of Project Two with the potential of 1GW in capacity. In total, the four Hornsea projects could add up to 6GW. In August 2015, Dong acquired the development rights to the Hornsea zone from its Smart Wind consortium partners, Mainstream Renewable Power and Siemens Financial Services, for an undisclosed fee. At the time of the last streamlining announcement by the Crown Estate in August, it was also revealed Vattenfall and ScottishPower Renewables had ended their joint venture developing the East Anglia Zone. Each developer agreed to take a portion of the zone each and develop projects singularly. Iberdrola subsidiary ScottishPower Renewables also gave a positive final investment decision for its 712MW East Anglia One project in February. The developer is planning a further three projects in its part of the zone, having agreed the project sites with the Crown Estate. East Anglia Three, with potential capacity of 1.2GW, was accepted for examination by the planning authorities in December. ScottishPower Renewables will also take forward the East Anglia Two and East Anglia One North projects, both up to 800MW in capacity. Finally, Vattenfall has agreed its specific project sites with the Crown Estate. The Swedish utility will take forward two 1.8GW projects. One of the projects was the proposed East Anglia Four site, under the joint venture. It has been renamed as Norfolk Vanguard, by the Swedish firm. The total East Anglia Zone will therefore comprise six projects, with a potential capacity of over 7.1GW. The Crown Estate said the UK offshore wind portfolio could total 31GW if all projects currently under construction, consented, in planning or in pre-planning stages are completed and added to the current 5GW operating in UK waters.